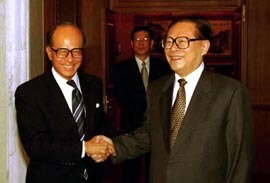 President Jiang Zemin met in Beijing on May 18 with Li Ka-shing, chairman of the Cheung Kong (Holdings) Ltd in Hong Kong. President Jiang spoke highly of Li Ka-shing's support of economic construction, education, and charity in inland areas. Jiang also praised his contribution to the economic and social development of Hong Kong, and said he hopes Li will continue to contribute to Hong Kong's long-term prosperity and stability. Liao Hui, director of the Hong Kong and Macao Affairs Office under the State Council, was present during the meeting. Come on Trevor, besides the fact that Jiang Zemin is no longer President, this is five years ago and the list of businesspeople who have met Jiang Zemin is enormous, this is of little consequence. The Port of Lyttelton faces competition from Timaru, Port Chalmers and, indirectly, Wellington and Nelson. I'd rather Christchurch City sold the whole damn thing to Hutchinson Whampoa.